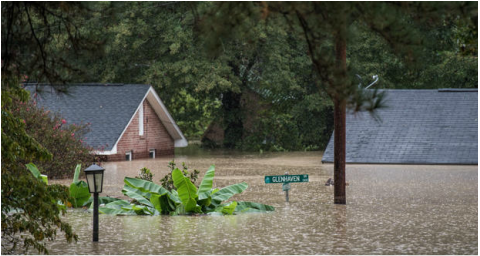 The most intense, great flood-like and long-lasting rainstorms in recorded history slammed South Carolina this week, bringing with them widespread destruction and lethally dangerous flooding. It is perhaps altogether fitting, in face of utter destruction of biblical proportions, to consider the fate of South Carolina in light of its recent profane history. It was not long ago, when to the disgrace of this nation, during the president's state of the union address, that a cowardly attention-seeking South Carolinian shouted his venom from the belly of the audience assembled in a chamber where every session is proceeded by a prayer. It may seem strange that any man should dare to ask a just God's assistance in such an endeavor. Quietly, the Army of the United States of America uncovered a racist group, F.E.A.R., operating within the ranks of the army stationed in the Carolinas. An army whose creed is to protect one nation, under God, indivisible with liberty and justice for all. A case of wrongful property seizure from a South Carolina American family of African origin was taken to the Senate of the United States, where in spite of a tradition of property rights and restoring property to its rightful owners, the Senate apologized to the family, but did not give them justice, jus fidus libertatum. One of those senators now seeks the presidency. Again, before their deliberations those senators dared to ask God's guidance. He gives to South Carolina this terrible storm as the woe due to those by whom the offense came, shall we discern therein any departure from those divine attributes which the believers in a living God always ascribe to Him?